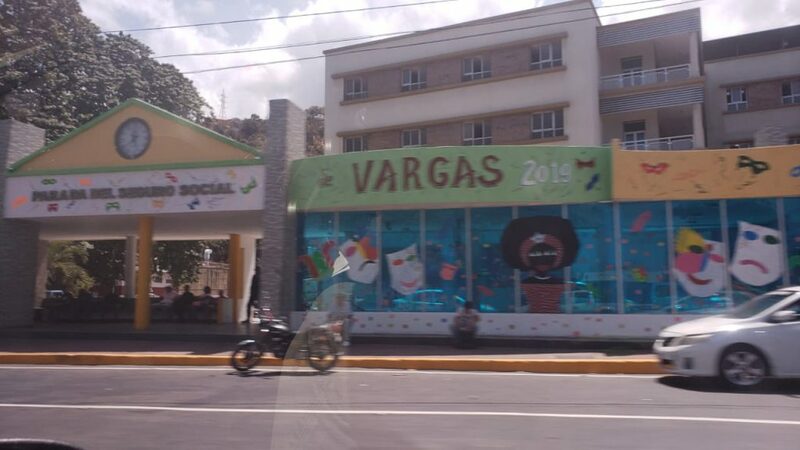 I picked an interesting time to visit Venezuela. The opposition leader had recently declared himself president, and the world was split over whether he or socialist leader Nicolas Maduro was in charge of the country. Meanwhile, media reports were saying there were food shortages, and people were waiting in long lines to get food, as the economy was collapsing and the currency was hyperinflating. The U.S. government was putting increased pressure on the Maduro regime, which could fall apart any day or respond with a heavier crackdown than ever before. Perfect time to visit my last major remaining Latin American country, huh?? In this post I’ll discuss the reality of the situation in Venezuela, which may contradict the news referenced in the previous paragraph. 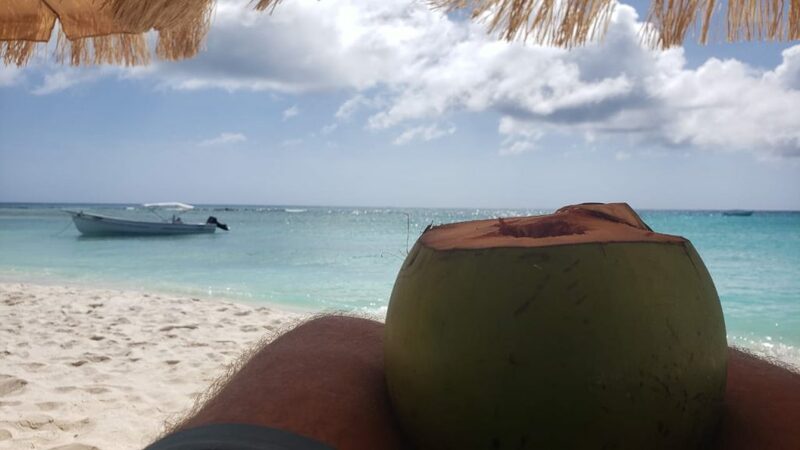 And I’ll also tell you about my incredibly beautiful island getaway in the middle of stay in Venezuela, which did also involve venturing into Caracas, rather than just lounging on the beach with coco locos. Lastly, getting out of the country was nothing short of a fiasco. 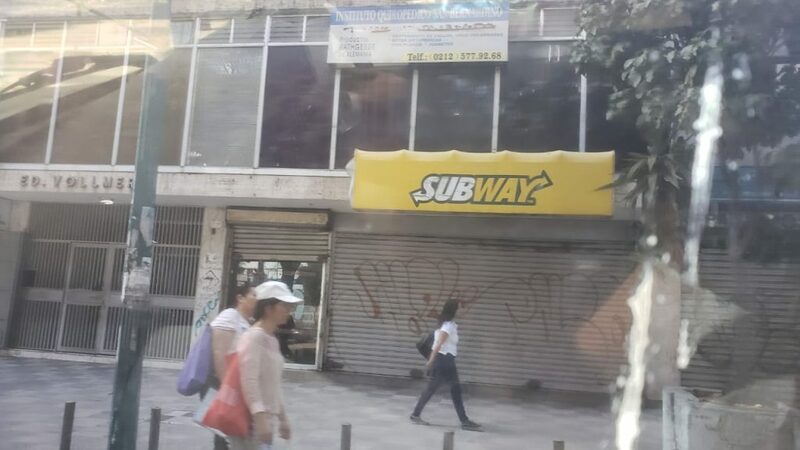 You didn’t think life in Venezuela looked like this, did you? 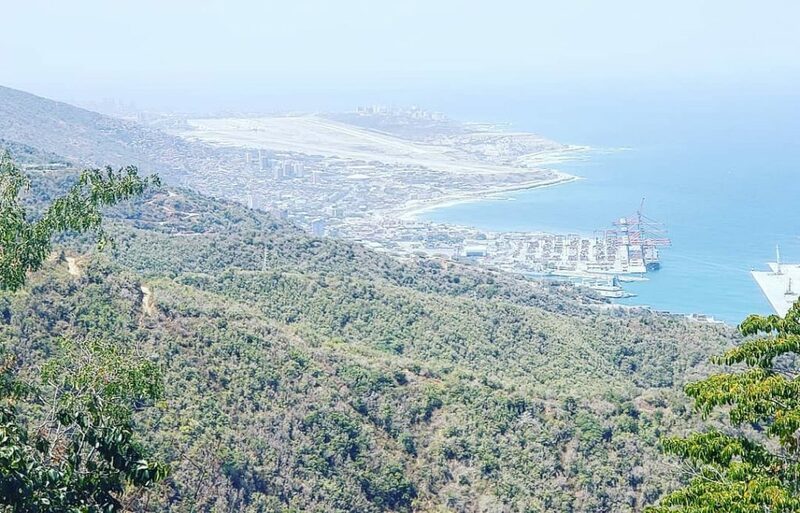 Why and how to visit Venezuela in 2019? You are probably aware that I am in the process of visiting every country in the world. 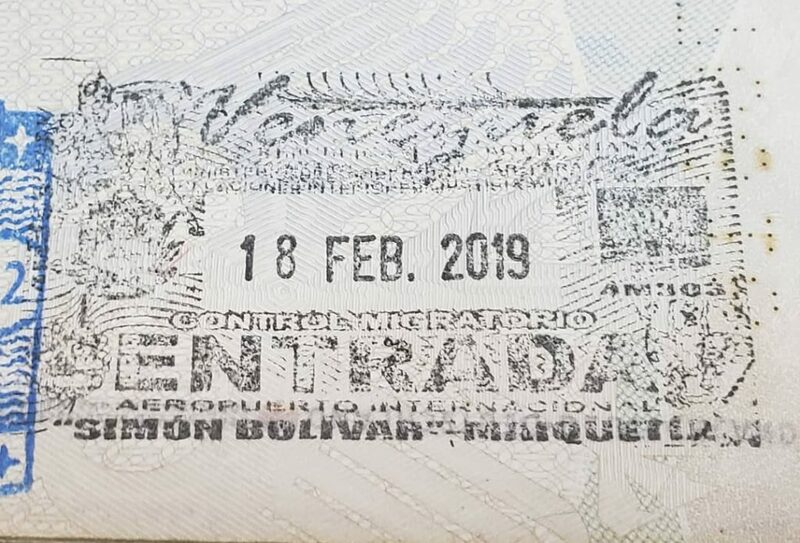 In Latin America, I only had three countries left to visit: Venezuela and the lesser known Guyana and Suriname, two of which I have now been to. The availability of tours in Venezuela has plunged as the country has plunged into economic and political crises. 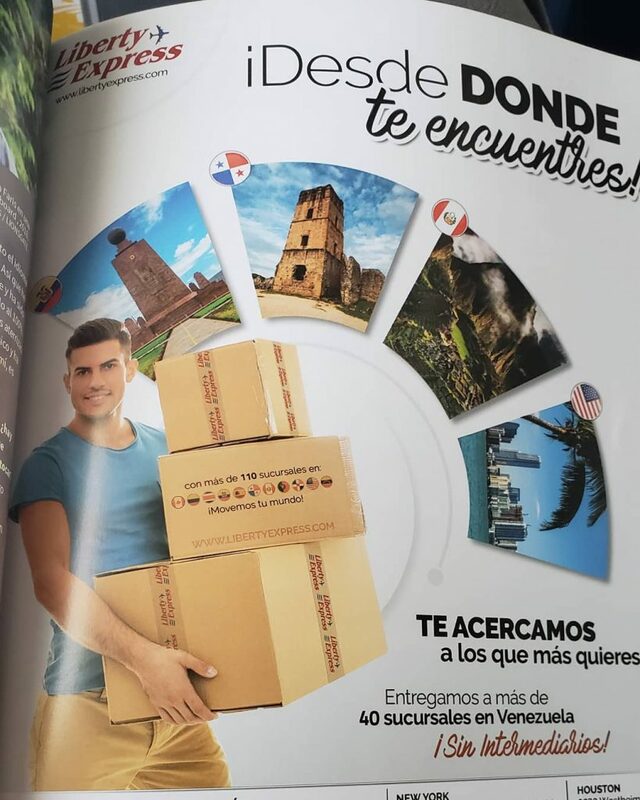 I was reading about recent tour reports and stumbled over one from a girl who visited Venezuela a couple months ago. She recommended a guy named Pablo. Other tourists were recommending him as well. I wrote to Pablo and asked him to organize something for me. Pablo is actually just 20 years old. But he is a very clever guy and very business-like, despite also being very nice. We chatted for a while on WhatsApp, and it was very easy for me to set up a tour with him. He offers a nice package holiday. 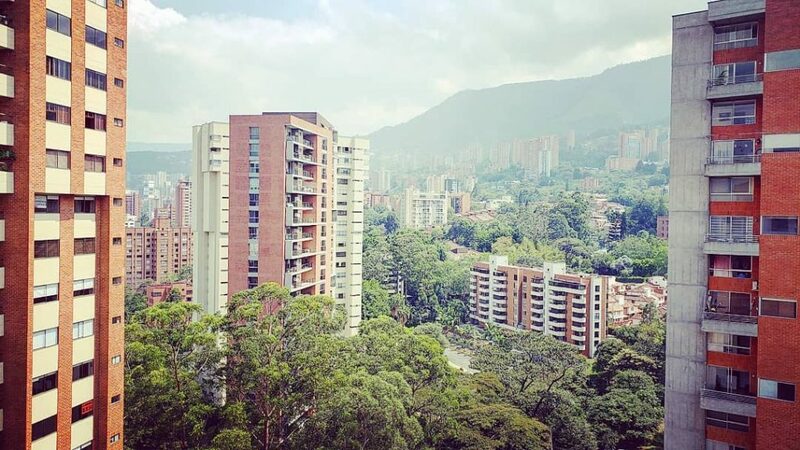 My Venezuela journey basically started in Medellin. I was in Colombia to put on a stateless seminar in Jardin, a town in the mountains about 3 hours away from Medellin. On the final night in Colombia, I was with friends and my Venezuela travel partner Benedikt, aka the senior nomad. We were having drinks at a friend’s flat in Medellin. I showed up late and that was a bit problematic because, while I was on my way, a friend of mine tried talking Benedikt out of going to Venezuela. My friend was telling Benedikt he should not go because it is so dangerous and he would die. This really made Benedikt scared. When I arrived, I had to calm Benedikt down. 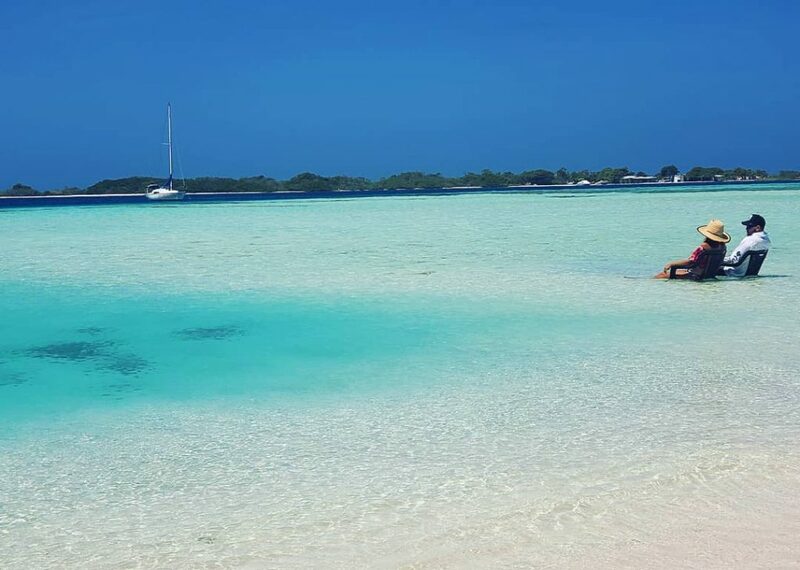 I told him exactly what we would do in Venezuela — stay in a hotel near the airport and then fly to the beautiful Los Roques Islands, which are some distance from the mainland. Other than that, we would head into the mountains for a day. Thanks to the spoiler in the intro, you already know it didn’t all work out that way. 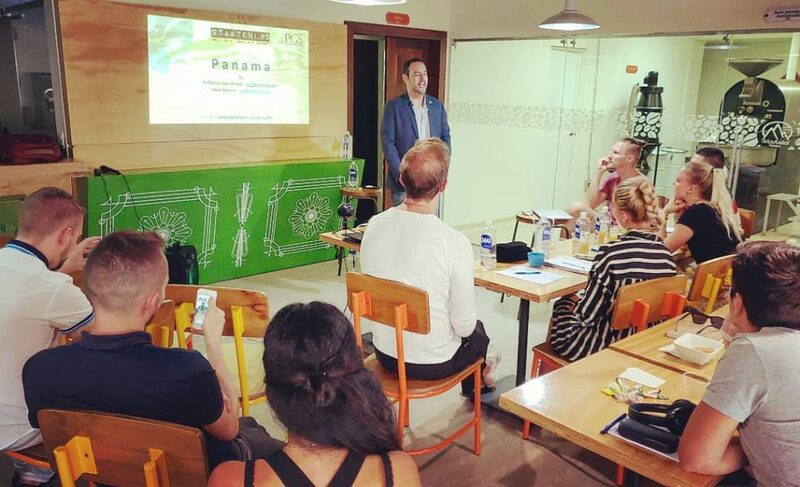 We did end up venturing down into Caracas, and we were lucky to get out of the country… but for a different reason or reasons. 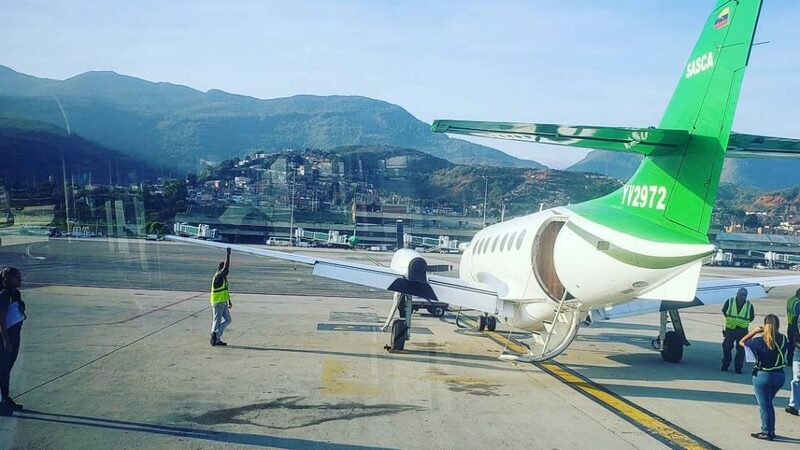 The following morning we had a direct flight from Medellin to Simon Bolivar Airport, Venezuela’s main airport. It is located in a city called Maiquetia, which is about 20 km northwest of Caracas. A mountain ridge separates Maiquetia from the Venezuelan capital. We were flying with Avior, a Venezuelan airline I would become quite acquainted with. At checkin in Medellin, the workers were surprised to see foreigners. They asked us questions about why we wanted to go to Caracas and if we had an onward ticket, which we had. Without any hassles, we boarded the Avior flight, which was actually a nearly full plane. And we weren’t the only foreigners flying to Maiquetia. There were two heavily tattooed Spanish guys sitting next to us on the plane. They were apparently going to some socialist meeting. We learned that after Benedikt struck up conversation with them. Benedikt speaks excellent Spanish because he lives in Mallorca. I also speak Spanish. In Maiquetia, the immigration officers were a bit more strict. They asked us about our exact travel plans, and they wanted to see a printed onward ticket. We didn’t have our tickets printed. They were on our phones. The officers were a bit skeptical. Eventually, they let us through. Compared to other border experiences, it was more or less harmless. Initial Venezuela impression – just like North Korea?? We exited the airport and met Pablo, who had organized transport for us to the hotel where we were staying the first night. It was actually a bit of an ordeal just getting into the vehicle taking us to the hotel. Pablo needed to make sure the driver was our driver and not some other guy who might take advantage of us or rob us. It took a while. As we waited, we snapped some photos of a travel office. 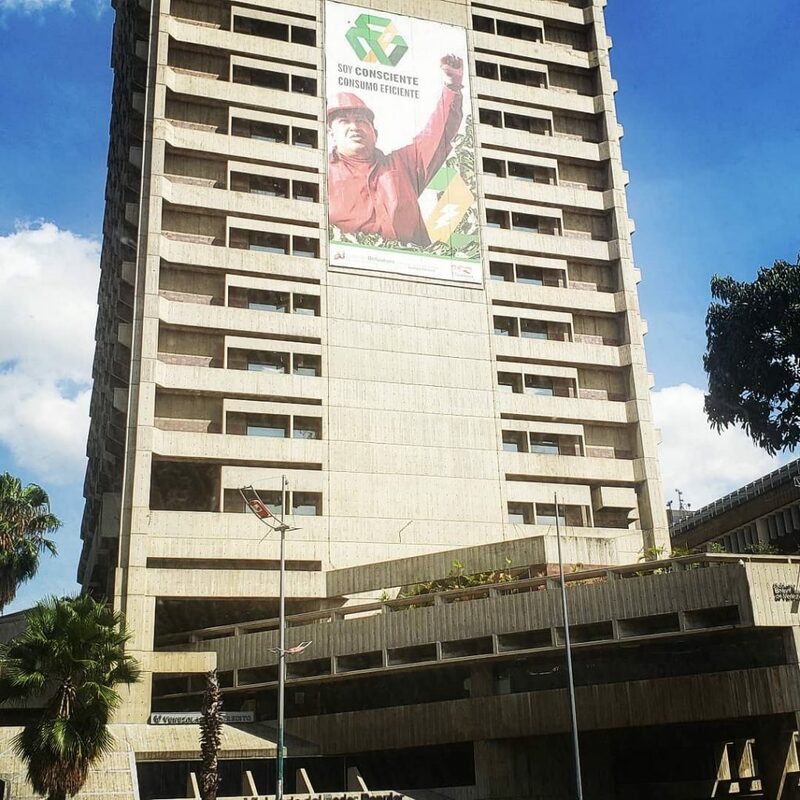 The office had photos of Venezuela’s “3 great leaders” on the wall. 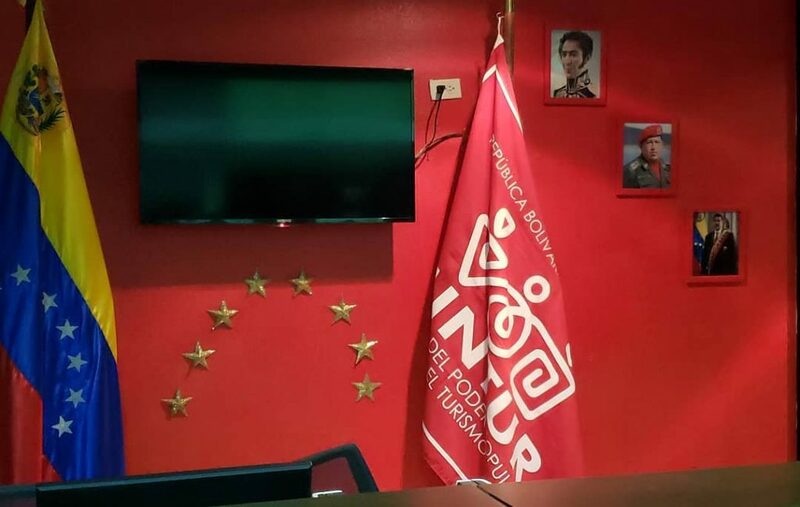 Photos of Simon Bolivar, Hugo Chavez and Nicolas Maduro were hanging in chronological order with Bolivar on the top and Maduro on the bottom. It was just like North Korea, except in the DPRK, the third and current great leader does not get eternalized with statues etc. 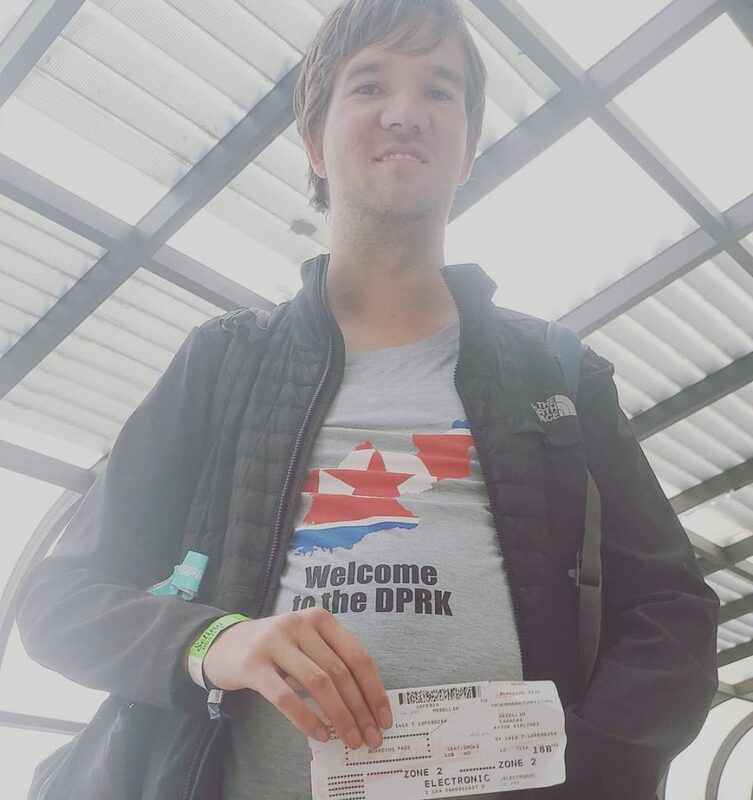 until he dies, as you learned from my trip to Pyongyang. After some time, a bus came to pick us up. The bus drove us to Catia La Mar, a city and port next to Maquetia. We got to see Venezuelan reality, though only briefly, because our hotel was quite close to the airport. We also spoke with Pablo about the situation in Venezuela. 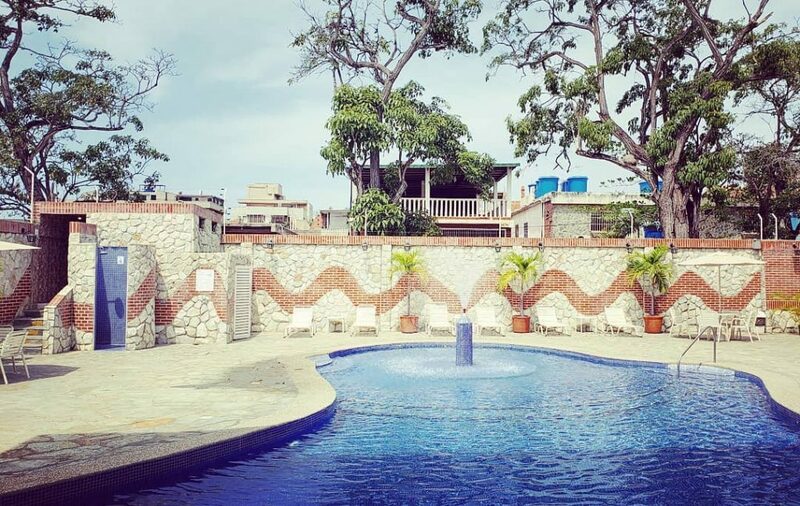 Hotel Villa Playa Grande was not aptly named, at least not in the current day and age of Venezuela. 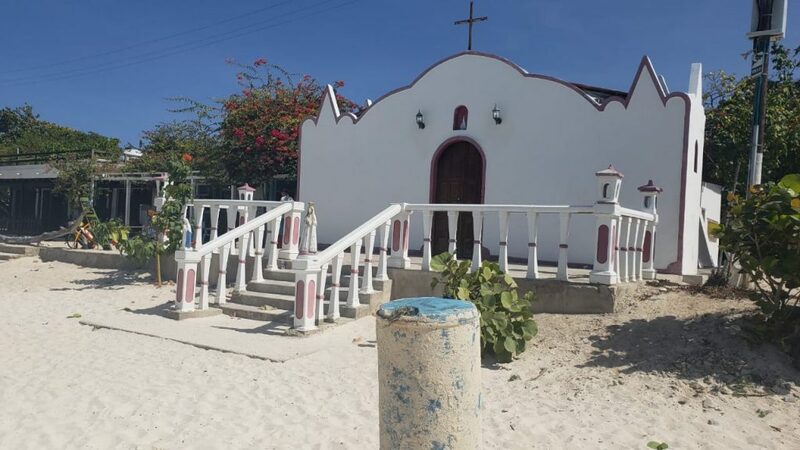 Rather than a large beach villa, it was more like “una prision.” There were walls about 3 meters high with electric fencing surrounding the hotel. Plus there was a full-fledged security detail. It seemed like we would get in the hotel but we wouldn’t get out. Unfortunately, at the end of the night we had to pay about $150 because we had two bottles of wine, some rum and a very good meal. Even though the food and drinks were available, they were very expensive because they basically have to import everything. 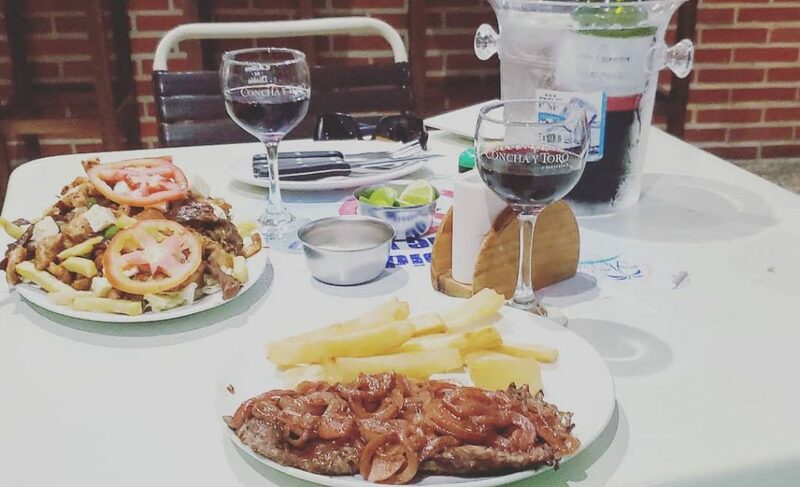 Still, it was good food, good wine and we were looking forward to traveling in the morning to Los Roques. Coincidentally, that night we met another German in our hotel. He arrived later than us and was a bit confused. 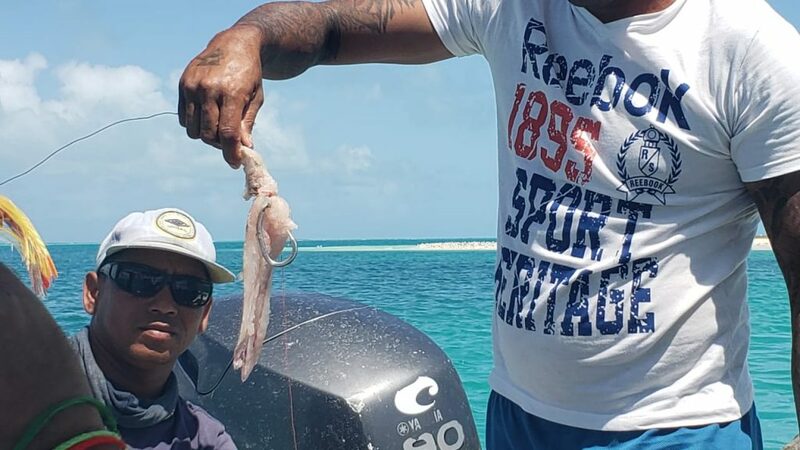 This man had a fly fishing hobby and was planning on going to Los Roques for 3 weeks to have some fun. 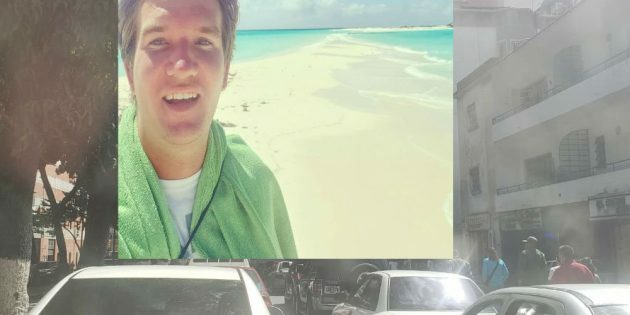 He booked a trip and was traveling alone, not really aware of what was happening in Venezuela at the time. Though unprepared, I think he was able to survive. The hotel staff told us to get to the airport four hours before the flight. We thought that was a bit much for a domestic flight, even it was in Venezuela. Then they told us three hours would be fine. When we arrived at the airport, we were told checkin only opens 45 minutes before the flight. We sat and waited. The airport was heavily guarded, so there wasn’t a safety concern. When checkin finally opened, we were first in line. Then came some surprising news from the airline. 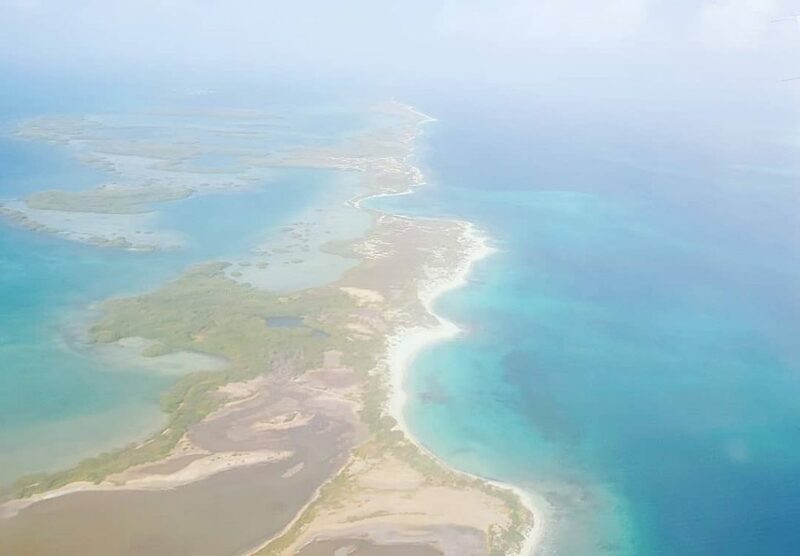 There were supposed to be two planes flying to and from Los Roques. The checkin guy told us one of the planes was not operational, and instead, one plane would be making two roundtrips. This meant several passengers had to wait for the plane to fly to the islands and back before they could board their flight. Several passengers had to wait for hours, but we got lucky and were able to board… or could we? I got through security just fine. That wasn’t the case with Benedikt, who was singled out. A security officer asked him what he had in his hand luggage. Benedikt had both a camera and a laptop in the bag. The security guy told Benedikt he needed to return to checkin and check the camera and the laptop, which of course is not normal. Everyone recommends passengers bring cameras and laptops onboard in carry-on luggage. Then the security guy asked Benedikt a question, “Do you want to collaborate?” Suddenly it made sense. The security guy was corrupt and he wanted a bribe. Benedikt responded by saying yes and asking how to collaborate. The security guy pointed to a little box inside a bag. He wanted Benedikt to place money in the box. Benedikt still had cash from Medellin — about 50,000 Colombian pesos, which is around 15 euros. He put the Colombian pesos in the box. The guy grabbed the money and then Benedikt was fine. All things considered, it was no problemo to pay a 15 euro bribe to a corrupt Venezuelan security officer. If Benedikt would have checked his laptop and camera, they probably would have been gone. Aboard the plane, Benedikt was telling the story and the flyfishing guy from Berlin overheard it. The German flyfishing guy was sitting next to an Italian man. It turned out the Italian man was the owner of the airline. How convenient!? The owner of the airline is married to a Venezuelan woman, and he lives in Los Roques. He told us corrupt security officers are bad for tourism and bad for Venezuela. He said he would call his friend at the airport authority and have him get rid of the corrupt guy. So, who knows? 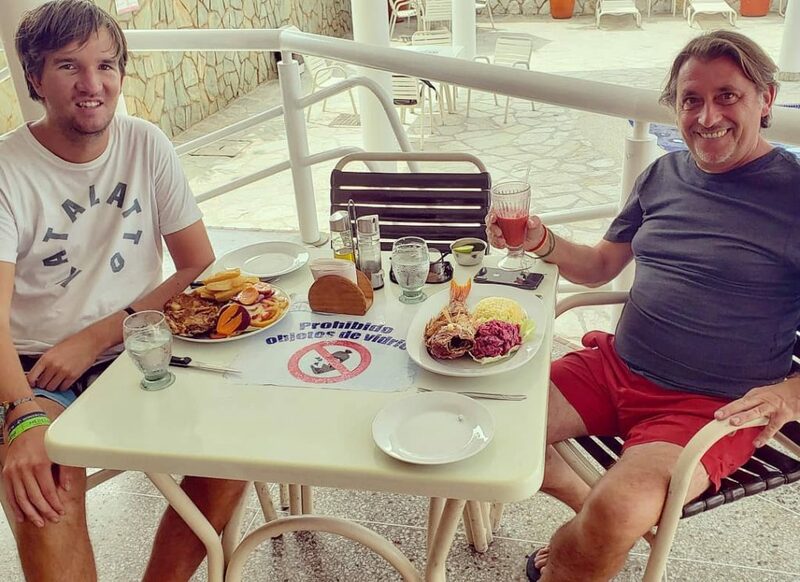 Maybe the guy who demanded demanded a bribe from Benedikt is now sitting in a prison in Caracas. As for the actual flight, we were flying on an approximately 12-14 passenger plane belonging to the Sasca airline. 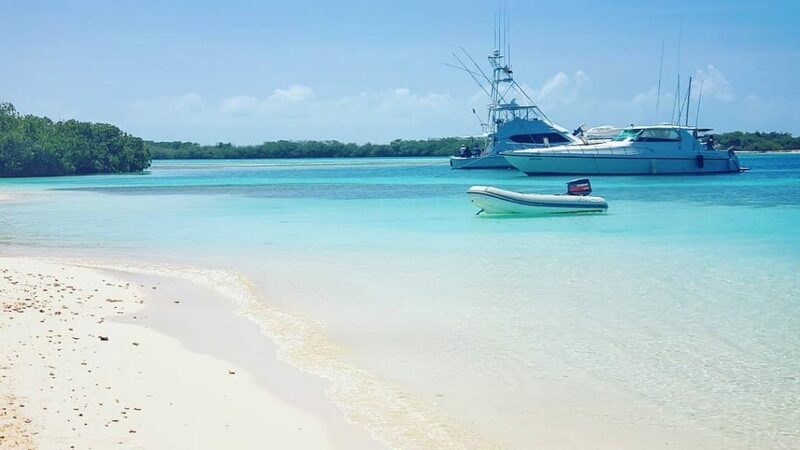 Sasca makes regular trips back and forth between Los Roques and the mainland. Let’s just say, this route is beautiful. It’s just a 45 minute hop from Maiquetia to Los Roques. The first 30 minutes of the flight are not that eventful, but the final 15 are stunning. 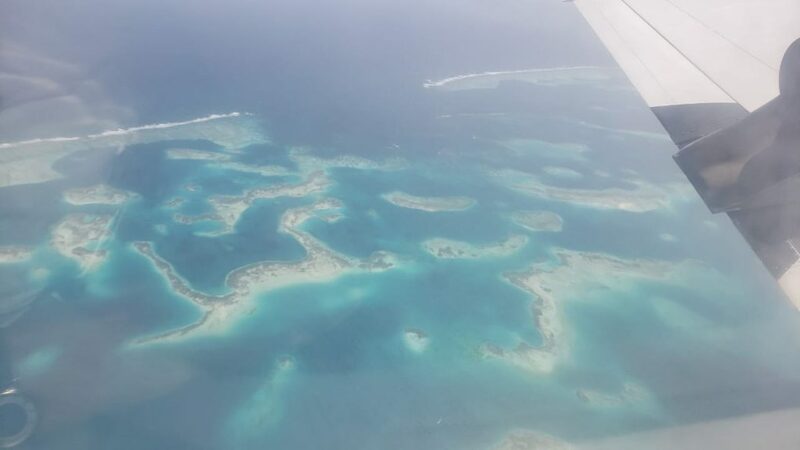 You fly over islands, coral reefs and very azure water. Upon landing, we were in for another surprise. Benedikt’s checked bag went missing. Actually it wasn’t missing. We were told his luggage would be coming on the next flight because our flight was full, and there was no space for his luggage. This delayed our beach time since Benedikt’s swimwear was in his large bag. We checked into the Posada Galapagos, our Los Roques hotel. It had nice rooms and a nice interior. But, it wasn’t quite like sleeping on the Galaxy beside the sea creatures of the actual Galapagos. Still the Posada Galapagos was plenty comfortable for this archipelago getaway. Venturing out by foot, it quickly became apparent that the main island was small but mountainous, or at least very hilly. We came across a pair of hills with landmarks. 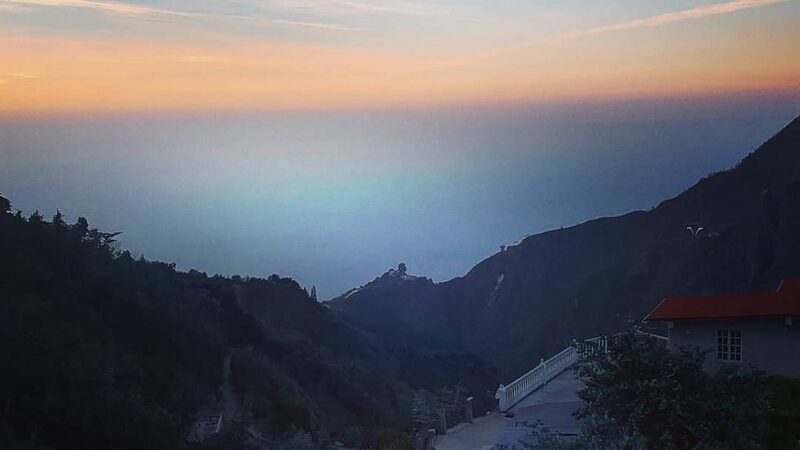 One hill had a lighthouse and the other had a cross. We wanted to climb up the lighthouse, but there was just a ladder going up about 30 meters with no safety mechanisms. So we didn’t dare climb it. We did make it up to the cross. 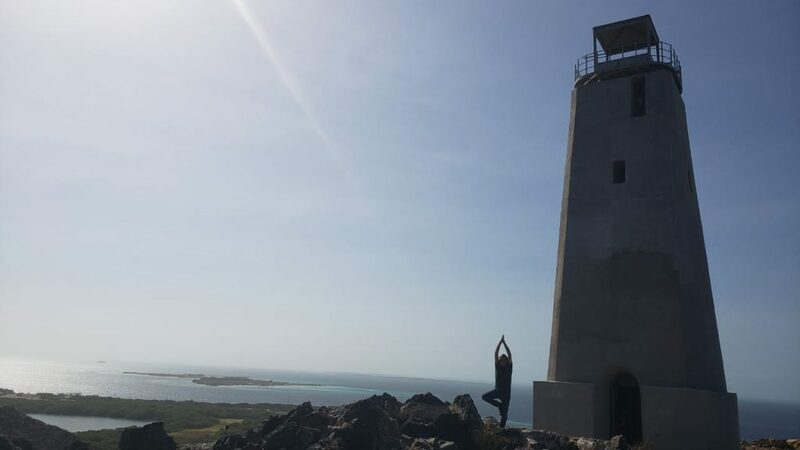 Despite not making it up the lighthouse, we managed to enjoy great views of the azure sea and nearby cays, as well as the town on the main island. 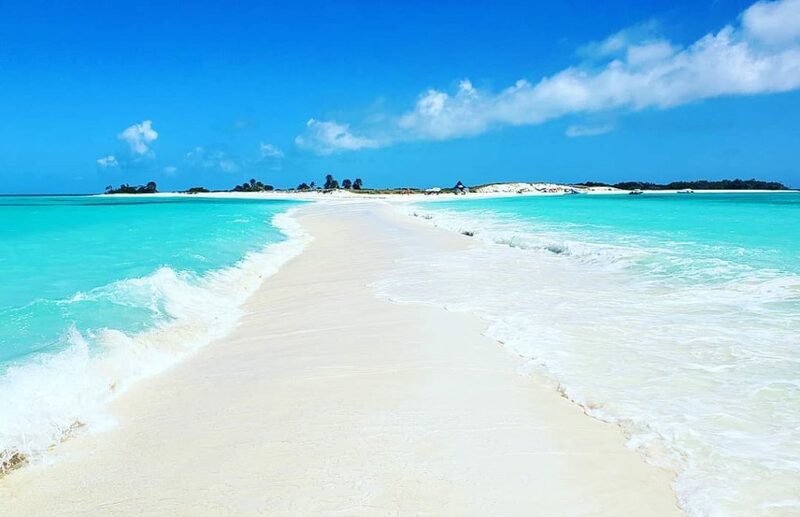 Los Roques has several hundreds little islands and cays. 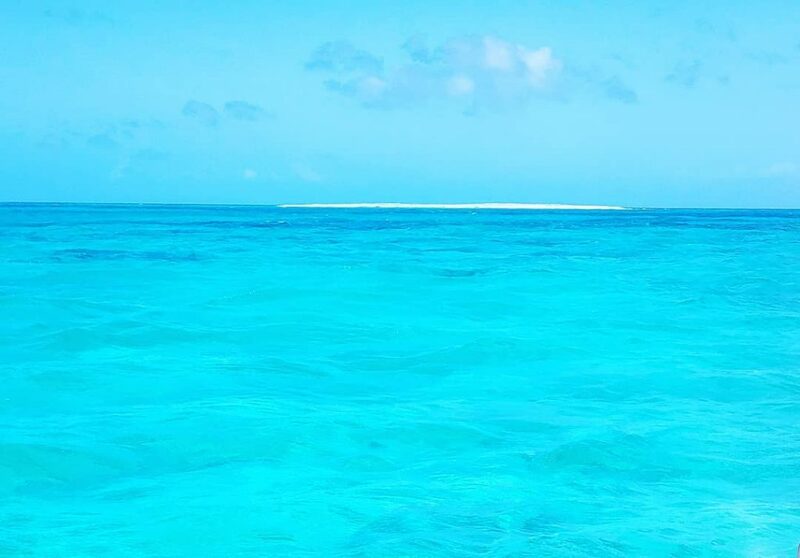 A cay is basically a small island atop a corral reef. There was not much vegetation in the area. But there were a lot of cacti. I made the mistake of going out in flip flops. By the end of the walk, there were lots of sharp thorns stuck in my flip flops. It wasn’t so pleasant for my feet. We returned to the hotel, drank a coffee, waited a bit and Benedikt’s luggage at last arrived. Benedikt changed, and we promptly embarked on a boat tour to a nearby cay. The boat ride was very short. After 10 minutes we arrived at a very white sand beach with very light blue water. The boat crew set up umbrellas and chairs for us and then left us alone on the island for 6 hours. That was actually quite a lot of time for this little island. I went for a dip in the water, which was surprisingly cold. I went snorkeling for a bit, but there was not much to see — just sea grass. I walked all around the island, basically trying to get out of the sun, which was very bright. I ended up with a noticeable sunburn from this afternoon. Even though this seemed like a tiny, unoccupied island, it is actually quite a party location. We were right by a small bay where there were a bunch of yachts anchored. 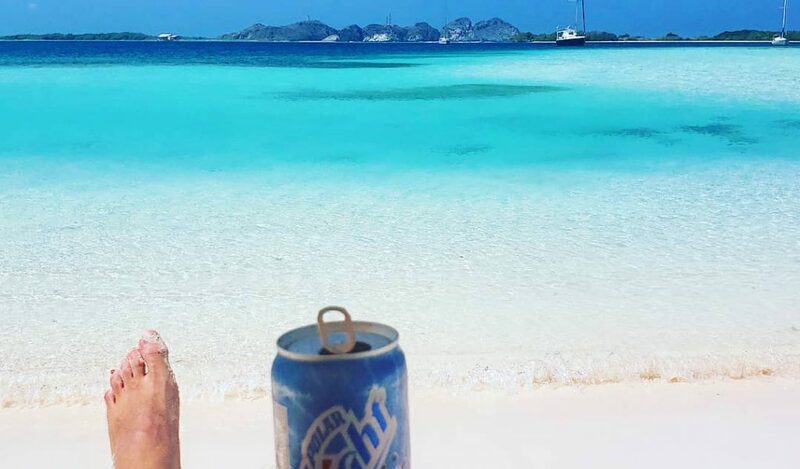 Los Roques is known to attract the Venezuelan elite who arrive in yachts and anchor them in the archipelago. Other than exploring the not-so-entertaining little island, I sat and drank beer on the beach with Benedikt. Conveniently, Google Fi worked out here, so we still had an internet connection. We even formed Benedikts new tax-free company for his blog from here – guess where? Back on the main island, we went on a walk through town. The town does not have paved streets. All of the streets are sand. But the houses are nice. And the people are friendly. Los Roques is very safe. 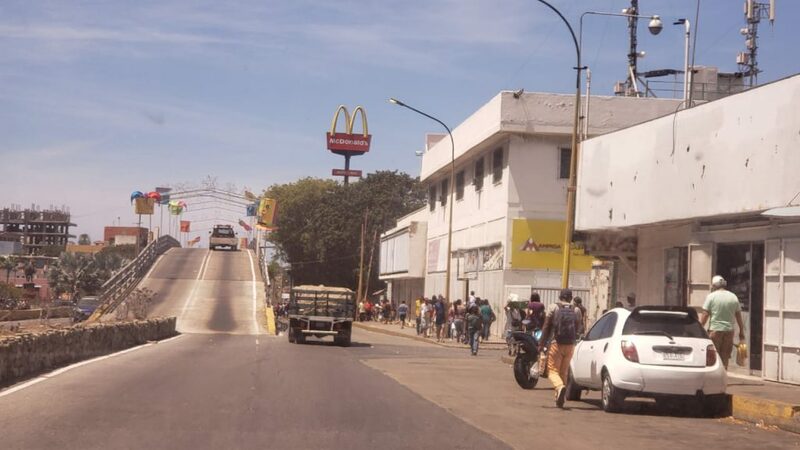 There is no crime in this remote part of Venezuela. Want to live in Venezuela? 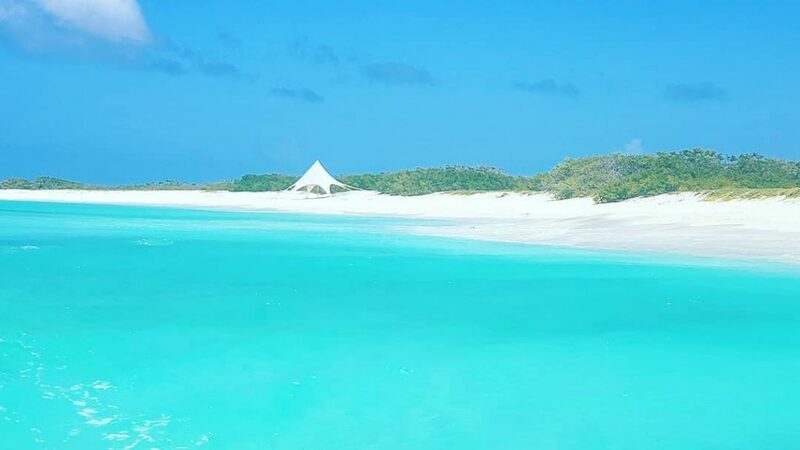 Day 2 in Los Roques was our trip to the famous Cayo de Agua, an island tucked away in the west of the archipelago. 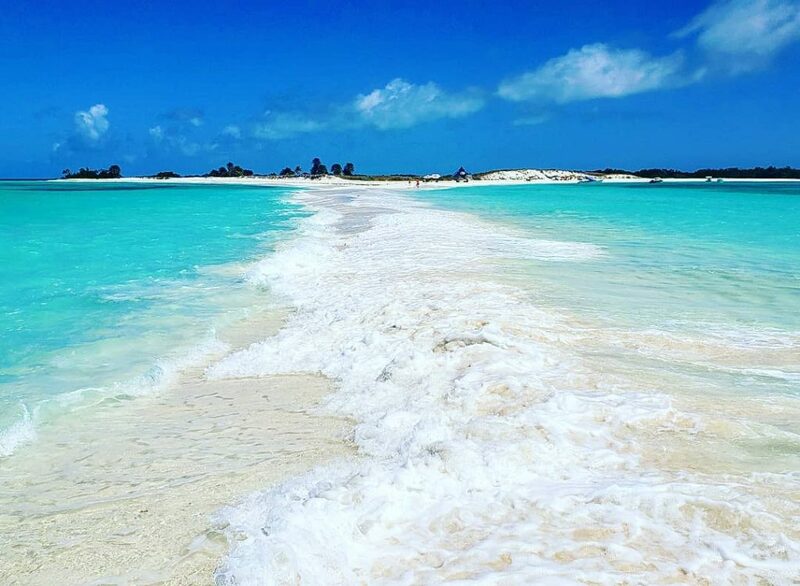 Cayo de Agua is basically split into two islands with a sand bridge connecting the two sides. This destination is Venezuela’s postcard beach. 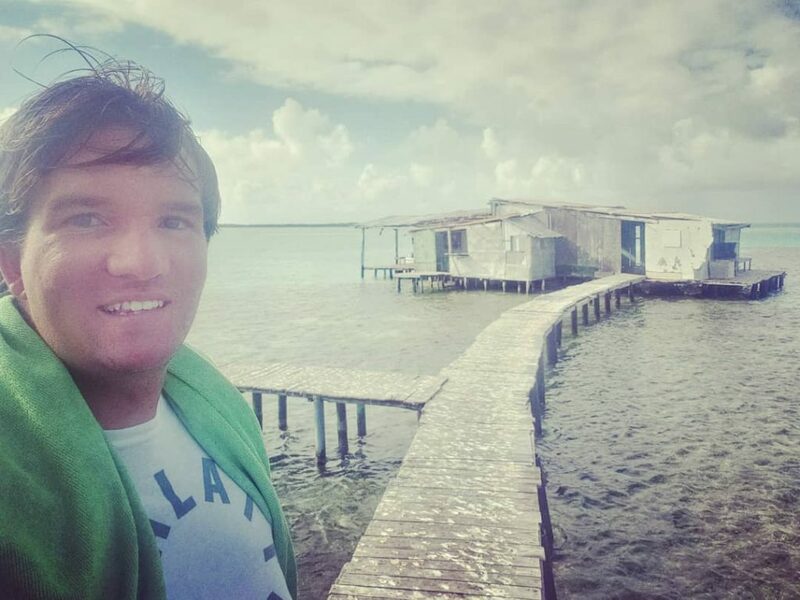 We paid $250 to hire two guys with a boat to take us around the archipelago, including to Cayo de Agua. The trip covered long distances. There was a lot of boat riding involved. But petrol is very cheap in Venezuela, so long drives are affordable. After setting out at sea, we first hit another postcard beach — white sand, azure water, dreamlike setting. Then we continued to a turtle hatchery. We gave $10 to the local guy (probably enough for him to live off for several weeks), and he explained to us all about the hatchery. They collect all kinds of sea turtles. 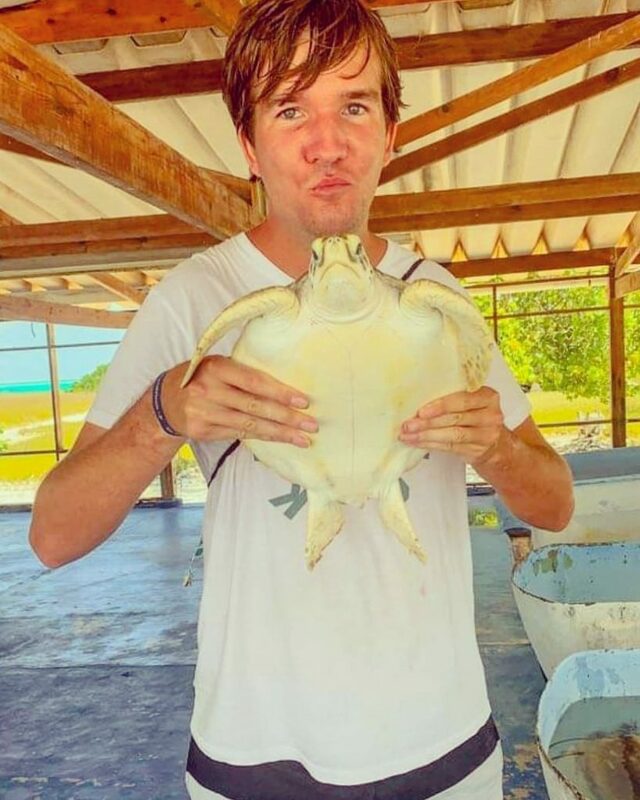 The turtles face danger in Los Roques coming from humans and the many fish in the water. 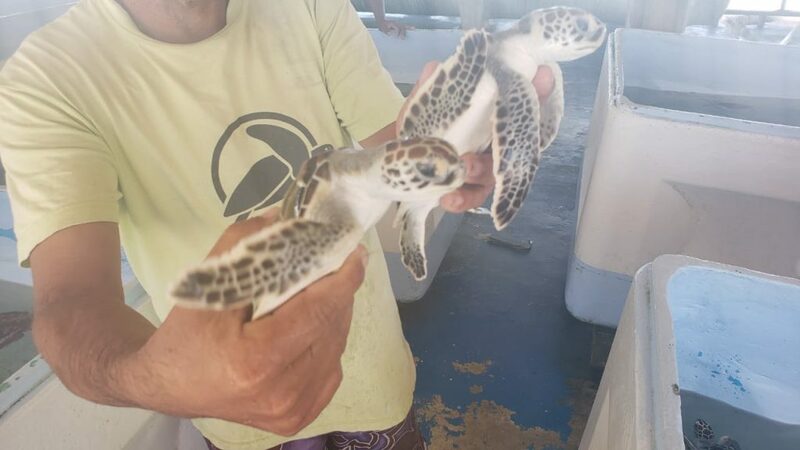 The hatchery has different tanks with turtles of different ages. They grow the turtles up to 2 years old, and the turtles can live to be 100. We got to touch some of the turtles, and I picked one up. After having some fun with the turtles, we thought we were headed for Cayo de Agua. But first, our guides came up with the idea to try to catch a barracuda. Earlier in the day, they had already caught some fish, and they used a large chunk of a fish as bait. But no barracuda bit. Still, with the remaining fish and some sea snails, our guides made a very yummy dish. It’s called ceviche. It’s basically raw fish with citrus juice and seasoning. I couldn’t eat it because I’m allergic to fish, but Benedikt said he had never eaten such tasty seafood. My guess is it was so good because the sea snails were very fresh. 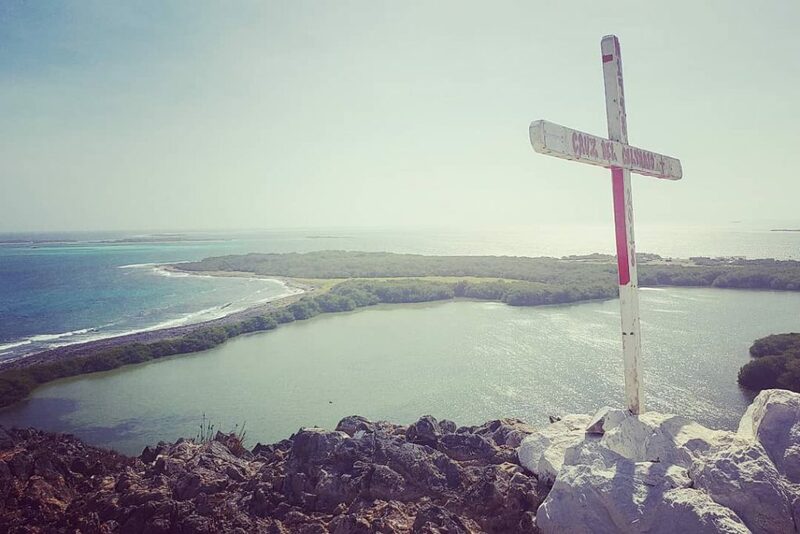 We finally made it to Cayo de Agua. The sand bridge is quite a sight. Unfortunately, we did not cross from one side to the other. The tide came in, and there was too much water for us to cross while holding cameras and other equipment. The water was also too shallow to cross with the boat. So we broke out the umbrella and beach chairs again and chilled for about an hour while taking in the beautiful surroundings. Our guides cracked open a coconut from the turtle hatchery, and we indulged in coco locos as we relaxed in socialist paradise. On the way back to the main island, we visited a lagoon with a mangrove forest, as well as a starfish alley and a sea snail house. 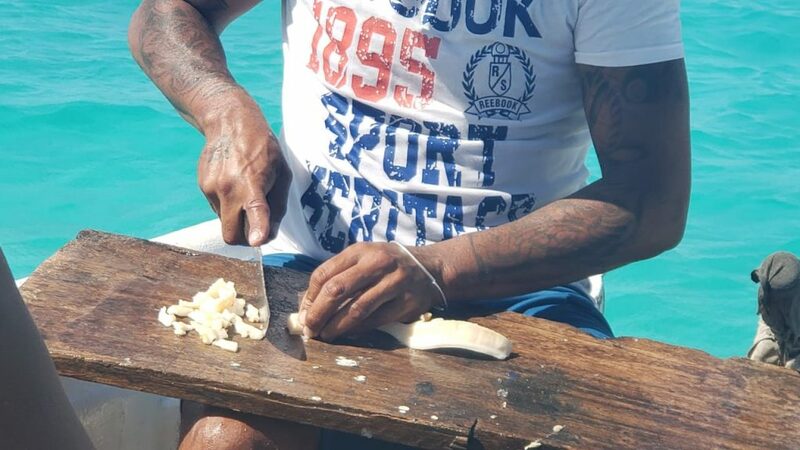 Los Roques is well known for its sea snails and its protection of them. We also stopped at abandoned shack perched above shallow water. I joked I would buy it and convert it into an overwater villa. All throughout the day trip we passed amazing beaches, which are the primary attraction of the archipelago. We returned to our posada and its Italian restaurant for our final meal in Los Roques. I told them multiple times I’m allergic to seafood, but my broccoli pasta ended up having some anchovies in it. I got the taste of the anchovies in my mouth and spit it out. They were basically trying to poison me. The meal was mostly fish, which I had to skip. But I got to have some chicken and some nice Italian pasta, which admittedly tasted good. While I still think they were effectively trying to poison me, I forgave the Italian hosts because the available booze and ambiance healed the wound. The hotel bar basically turns into a karaoke disco some nights. That was the case for our final night in Los Roques. The Italian owner of the posada was singing old opera and Andrea Bocelli songs. We sat at the bar, listened, drank and got a good laugh. We joked that the owner looked like a retired Mafiosi – which actually might be true…. We were supposed to fly back to the mainland at 9 am. Again, only 1 of the 2 Sasca planes was operational. This time we did not get lucky. At checkin, they asked us if we had an international connection to catch upon landing in Maiquetia. We didn’t. They told us we could not board then. Rather we would have to wait two and half hours for the plane to fly to the mainland and back. We waited and eventually boarded. 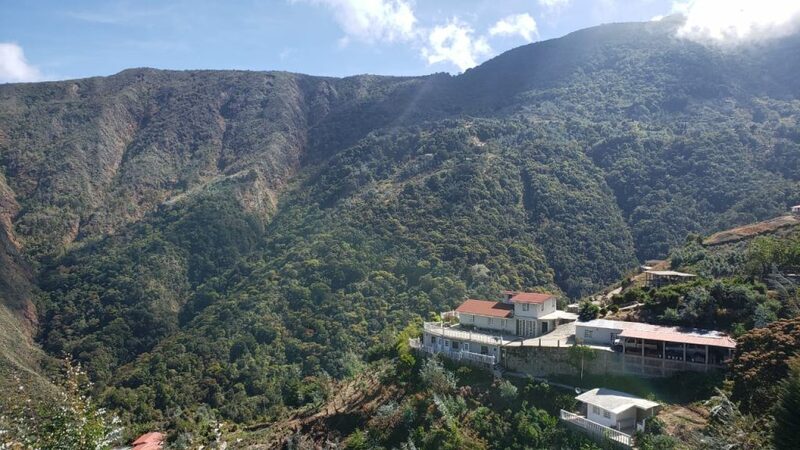 The plan was, upon returning to the mainland, we would stay up in the mountains at some old Venezuelan guy’s finca (estate). Pablo organized it so that the finca owner, a Venezuelan pensioner by the name of Rodolfo, would pick us up at the airport. Rodolfo previously worked for the government as a veterinarian. Now a pensioner, he of course needs another source of income in order to live in Venezuela. 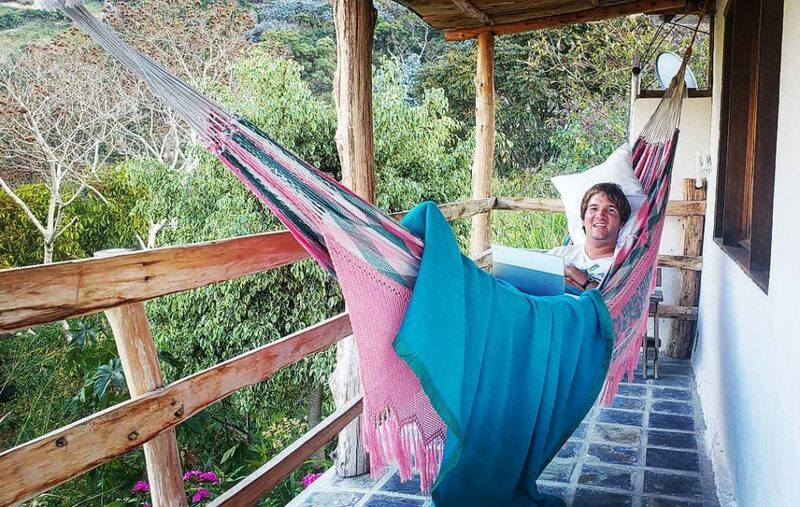 So he hosts guests at his finca up in the mountains above Caracas and operates a restaurant there as well. We hopped in Rodolfo’s pickup, and he drove us from the airport through coastal towns and up the mountain into Avila National Park. The area is in the Cordillera mountain range, and it’s pretty high up. Rodolfo lives in Galipan, a town on the northern slope of Cerro el Avila. There are two roads going up to Galipan. One is from Caracas, and the other is the coastal route we were taking. It’s a very steep, windy road that you can only manage with a 4-wheel drive. Pretty quickly we had gone from sea level to an altitude of nearly 2,000 meters. I got a little dizzy and showed some signs of altitude sickness. 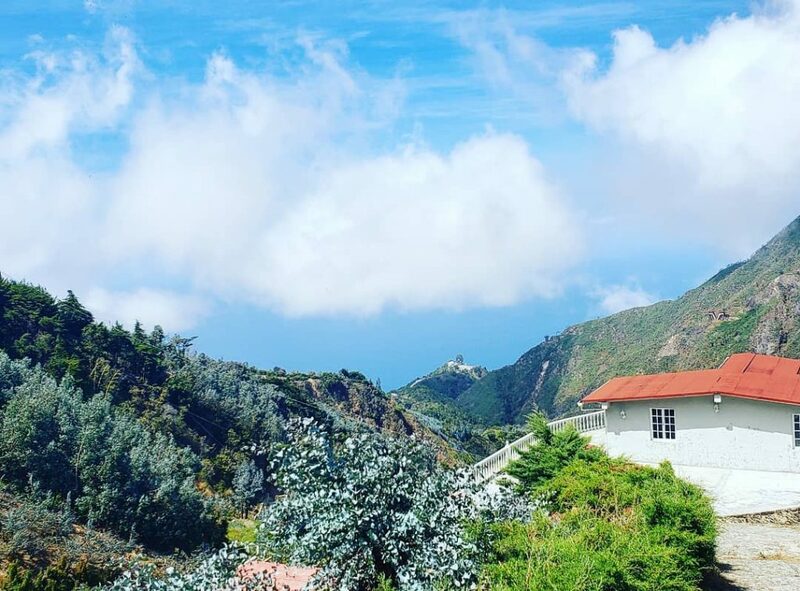 Our finca… will the clouds part? But it was a beautiful ride with views of the sea. 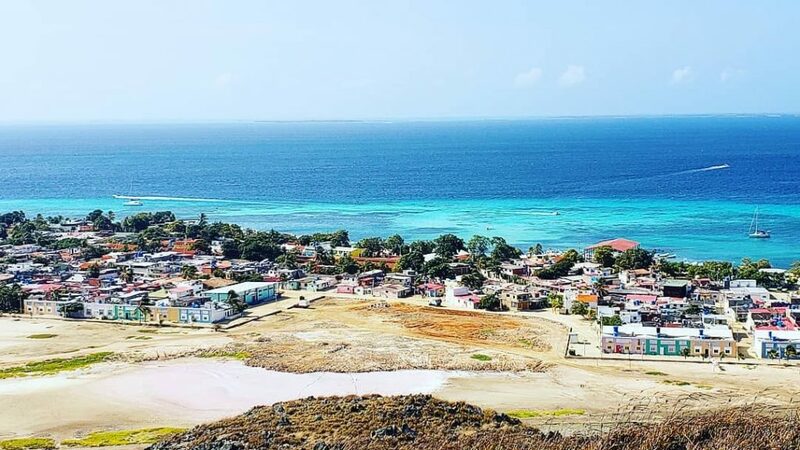 You can basically see the Caribbean Sea from everywhere in Galipan. The problem is, though, it is hard to distinguish the sea from the sky unless there are clouds. When we arrived there were plenty of clouds, and at times we even drove through them. When we reached the finca the clouds dissipated. At the finca we enjoyed a lunch that was very basic — some bread, cheese and ham — but had views of a subtropic landscape with lots of trees and the Caribbean Sea below. The following morning we went for a walk around town. Galipan is a very safe place to walk around. 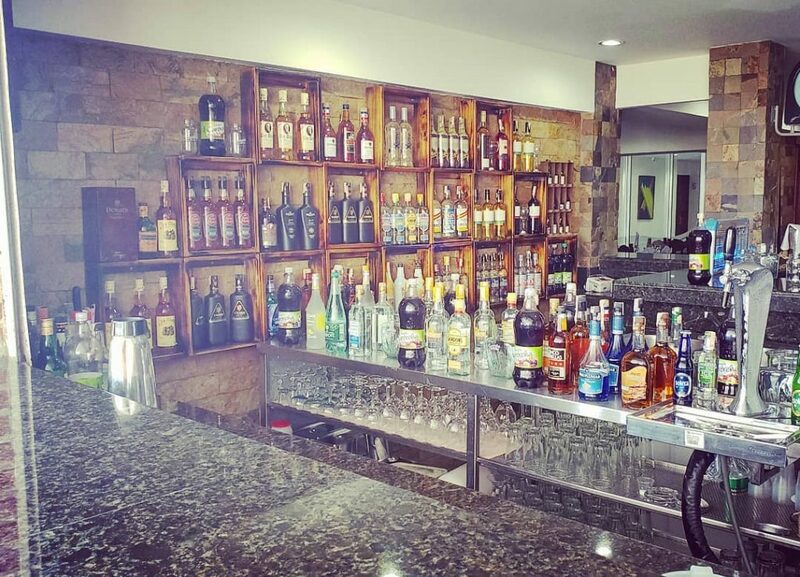 There are a bunch of fincas, or posadas, owned and operated by locals. And of course there are great views. But the highlight of our stay up in the mountains was, of course, when we ventured down in to Caracas. Visiting Caracas wasn’t so dramatic either, truthfully. Maybe it would have been, though, had we not taken precautions. It definitely wasn’t part of our package holiday to explore Caracas amid a political crisis that could boil over at any point. It just so happened Rodolfo’s son had to head into the city for some business, and Rodolfo asked us if we wanted to go with. We did, regardless of the risk. The only things we took with us were our passports, our phones and some dollars — just in case something happened or some officers stopped us. We got in the car and first went a little bit farther up the mountain, then over the top and down the other side. Our first view of Caracas was from very high up. We snapped some photos of the skyline as we cruised down the mountain. During the drive, I concentrated on live-streaming the interior of Caracas and now and then lowering my camera so that no police saw it. We feared the police stopping us and robbing us of our possessions. But that didn’t happen, and I did get a good picture of things despite my focus on the Facebook stream. Actually, the police is still somewhat reliable – the problem are the national guards of Maduro terrorizing their own people especially in the poorest zones of town. Since Guiado came on stage, this apparently reduced itself strongly. The rests of civil society starts to resist and name and shame those partaking in the colectivo gangs. With opposition takeover more and more likely, attacks decrease. 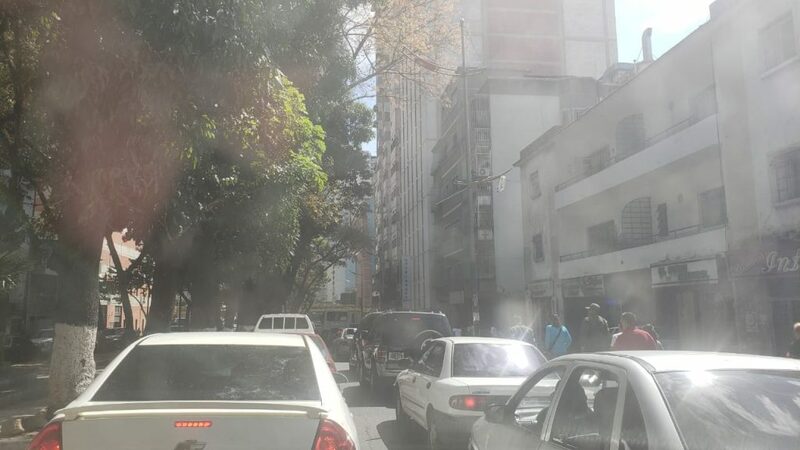 Caracas traffic… get out and walk?? Life is fairly normal in Caracas. McDonalds is open, and people are going around doing everyday things. We didn’t see a big crisis. Rodolfo’s son had to pick up some guests from the central park. So we drove through the heart of the city. Nothing significant happened. Rodolfo’s son, as well as a a lot of locals we spoke with, confirmed to us that the crisis in Venezuela is not at its peak right now. People said the situation had been a lot worse, particularly in 2015 and 2016. Nowadays most people have plenty of access to goods. This may be due in part to Russia providing a lot of aid. There are plenty of food options, including meat, at supermarkets and restaurants. The problem is not a lack of food. Rather, the problem is that people are very poor due to socialism and many cannot afford enough food. There is a rationing system where people stand in line to get goods — and that is what appears in the news. What is actually missing in Venezuela are medicine and medical supplies. This can result in ill people not receiving the medical treatment they need and possibly dying. 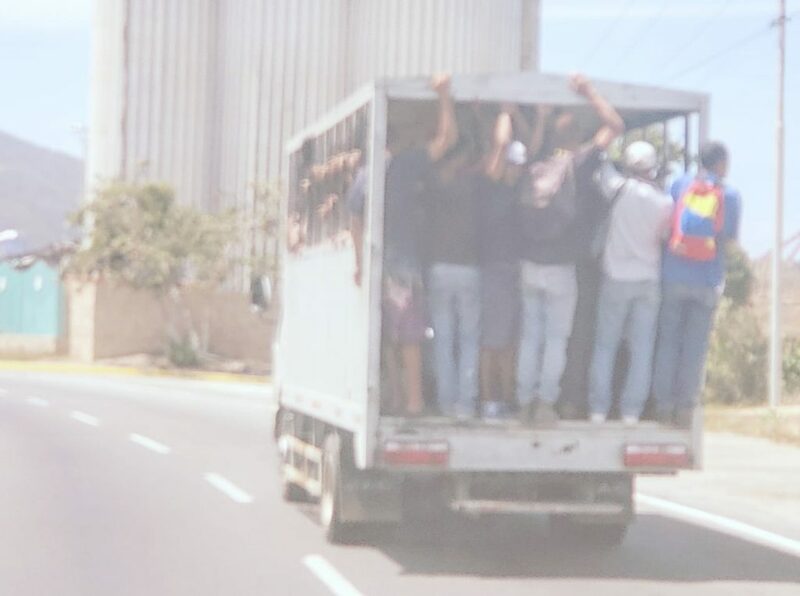 Getting out of Venezuela… you can get in but not get out?? First, things went wrong on my ride to the airport. I got out at the wrong terminal — the domestic one, rather than the international airport. I had to walk on a street about 500 meters to get to the international terminal. It felt sketchy, but it wasn’t dangerous because the airport was heavily guarded. I wasn’t running late. That certainly was not the problem. Despite getting off at the wrong terminal, I managed to arrive at the airport 3.5 hours before my flight. I waited. And waited. And waited. At 2 hours before departure, no one was there. At 1.5 hours before departure, there was still no one there. I asked what was going on and was told I was early and that people would show up 1 hour before departure. My flight was still listed on the departure board, but there was no checkin. I finally accepted the flight was canceled, and no one even bothered to inform me. I panicked… for a little bit. Then I started thinking. It would be fine to stay at the finca another couple nights. But I realized an opportunity was arising for me. I could go to Panama or Medellin. 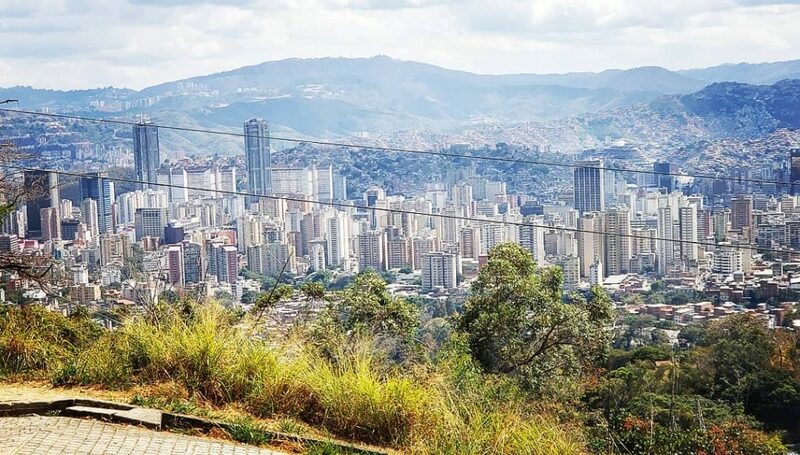 Returning to Medellin would actually be very useful because the week before I lost my driver’s license there and luckily my friend’s daughter found it. I had already arranged for the driver’s license to be mailed to my flat in Valdivia, Chile. However, it would be much safer to not rely on the Latin American postal system for such an important matter. Why is my driver’s license so important if I’m flying around the world you might ask? A German driver’s license is very hard to replace when you are out of the country, and replacing it means registering in the country again and risking tax liability — which is exactly what I do not want to do. Shortly following my canceled flight, there was one other scheduled departure. It was a Panamanian Copa Airlines flight. I asked if they had an available seat. The only seat left was a $2,200 business class seat, which was a bit much. I could reserve a seat on the flight, but only if I had an onward ticket showing I would be leaving Colombia. So I got online and went to Momondo and searched for a flight from Medellin to Guyana — where I was actually headed. I booked one of the several flight options from Medellin to Guyana via Panama. I got my flight confirmation and brought it to the Avior office guy, thinking I was in good shape again. The Avior guy told me the confirmation was not enough and that I needed the actual e-ticket. Again I waited. I completed the booking about 5 hours before the flight to Medellin was scheduled to depart. But final confirmation of the ticket can take up to 6 hours. It can be a lot quicker, but there is no certainty. I tried what I could to speed up the process. I sent Facebook messages and called a hotline, but I couldn’t get through. I had to just wait and hope. Things worked out. I got the e-ticket after about 1.5 hours, leaving me 3 hours before departure. I showed the guy my ticket. He still wasn’t satisfied. He told me the ticket had to be printed. I went to the Copa counter. They said they can’t print tickets. I went back to the Avior office. I had a little talk with the guy, and he finally budged. He said okay and reserved a ticket for me to Medellin. But the fiasco still was not over. It so happened it was possible at the Avior office to pay with a credit card, which is unusual in Venezuela. But I couldn’t swipe my card. I had to give the guy my details, which I did. The transaction failed. Then it failed a second time. I told the guy he had to make sure he was spelling my German address correctly. I think he messed it up. But eventually on the third try, the transaction went through. I was issued my ticket and could proceed to departure. Guess what… the fiasco goes on. I was almost through immigration control when, suddenly, the computer system blacked out. At first, I didn’t know what was going on. I thought on this particular day the immigration officers might be doing a thorough check of everyone leaving the country — going through people’s smart phones, scrolling through Facebook posts and finding all of the bad things they said about Maduro. So I started deleting Facebook posts and making others private. While doing so, I was warned by an immigration officer running around that it is not allowed to be on your smart phone while in the line. We had to wait a long time. By now, I was actually on the same flight as Benedikt, or at least had a ticket for it. He arrived after I had been waiting in the immigration line for an hour and a half. He came up to me and asked what was going on. I explained everything to him. About a half hour before our departure time, a lot of people became desperate. There was a flight leaving for Miami and one for Bogota. Those people really wanted out of Venezuela. They came up with the idea to tell the immigration officers to manually process our travel documents. Until that point, the immigration officers were standing around, laughing, playing on their phones and hoping the computers would turn back on. They had no contingency plan whatsoever. Additionally, they had no pens and paper. In the end, passengers gave them pens and paper. The officers began writing immigration details down on paper, and things started moving quickly. First the Miami passengers went through, then the Bogota ones, then it was our turn. The process actually went quicker than when the computer system was working. We made it to the plane on time. Of course, there was some problem on the runway, and takeoff got delayed a half hour. But finally, the plane took off. We were in the air! Benedikt leaned over to me and said we were out of Venezuela at last. This whole departure fiasco happened on the same day chaos erupted on the Colombian-Venezuelan border. 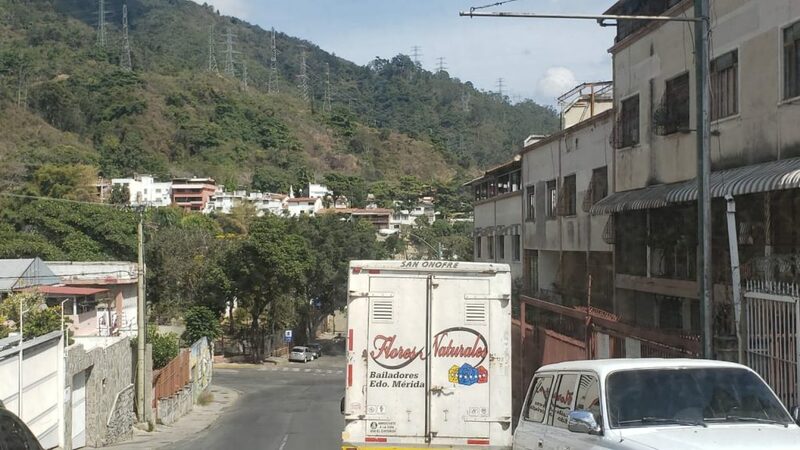 Violent clashes broke out on the border by the Colombian town of Cucuta, and a convoy that was reportedly carrying aid from the U.S. for Venezuela burst into flames on a bridge between Colombia and Venezuela. It felt to me like I got the last flight out. In fact, some of the flights departing Venezuela on the following days were canceled. 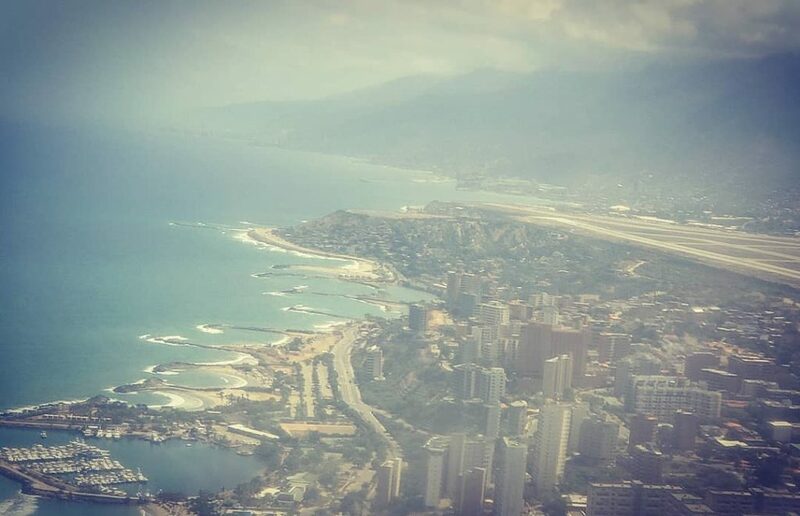 Venezuela’s main airport and neighboring port are not very busy at the moment. Venezuela, in reality, is not exactly the socialist hellhole that is described in many media outlets. But at the same time, the country is by no means in good shape. The currency is extremely devalued, and it is very hard for poor people to acquire goods, even food — despite them being readily available. Socialism made many independent Venezuelans dependent. Everyone getting a paycheck of the government basically gets no money due to inflation. Only those involved in Venezuelas narco-state profit. 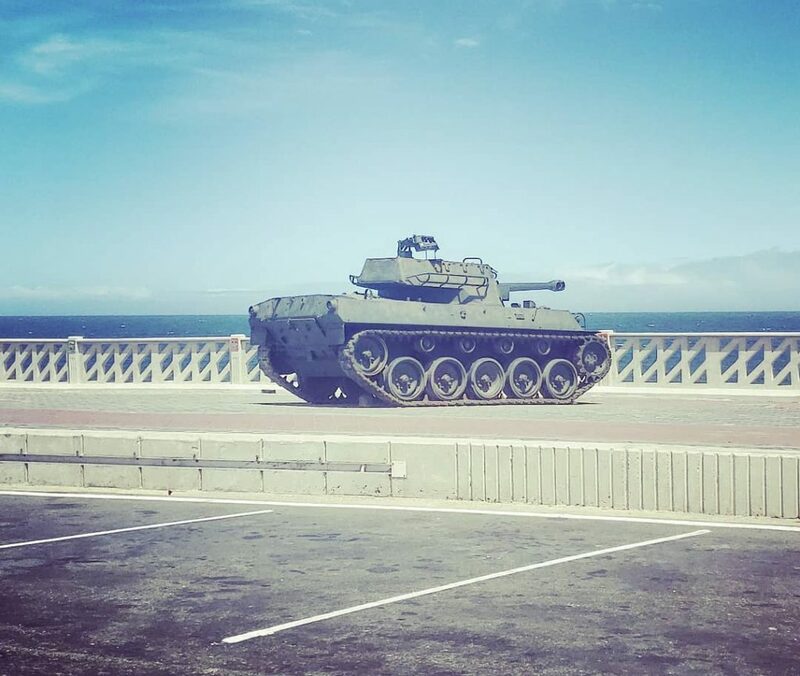 Waiting to fire upon Americans? Having spoken in Spanish with many people in the country, I can confidently say lots of Venezuelans are hoping for regime change. 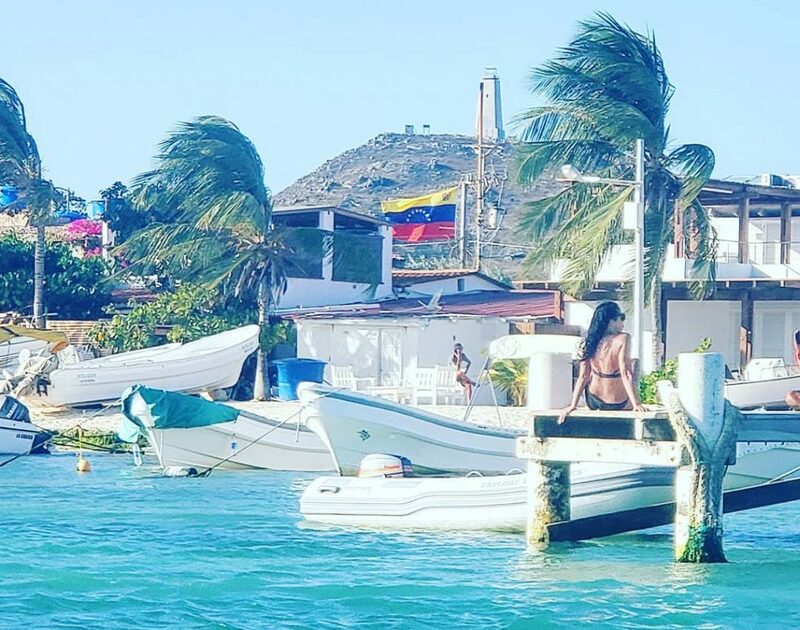 It is just that the political elites profit a lot from Maduro – and the good life they can have with their yachts in Los Roques. Venezolans unlike North Koreans are not shy to give their opinion – Rodolfo named socialism “a paradise of the lazy”. Personally, I think it is quite likely that the U.S. will invade Venezuela. Then Brazilian and/or Colombian troops might go in shortly thereafter. Though it would be better if the revolution comes from within. Interestingly, I learned during my stay that Venezuela is actually quite Americanized and U.S.-oriented. Lots of Venezuelans have bank accounts in Florida and fly there for holidays. Pablo, for instance, flew to Miami the day before we left Venezuela. It was also quite apparent that life during a crisis is much easier if you have foreign income and/or frequent contact with tourists or foreigners. For everyone reading this, those are some lessons to keep in mind… and reason to visit tax-free.today or librestado.com.